After its shots stopped falling, Riverhead did. If anything, the Riverhead High School girls basketball team’s 74-71 victory over Copiague in the Claude Byer Tournament Monday night was a reminder of how quickly momentum can change the game. The Riverhead High School field hockey team traveled in style Friday. It wasn’t an old yellow school bus that took the Blue Waves to Eastport-South Manor High School for their Suffolk County Class A quarterfinal. Just call her Miss Clutch. A lot was on the plate for this celebration of Riverhead softball. When Riverhead’s two high school softball teams faced each other Saturday night, not only was it a double senior night, but it was also an intriguing matchup of opposing coaches. Bishop McGann-Mercy’s Rose Horton and Riverhead’s Jackie Zilnicki have been friends since they were Little League teammates. Both went on to play for the respective teams they’re currently coaching. Last year Horton was Zilnicki’s assistant coach at Mercy. One of the things about being around long enough is you get to see coaches come and go. You sure hate to see the good ones go, though, and Dave Spinella is one of the good ones. Not to make it sound like Spinella, 38, has died or anything like that. 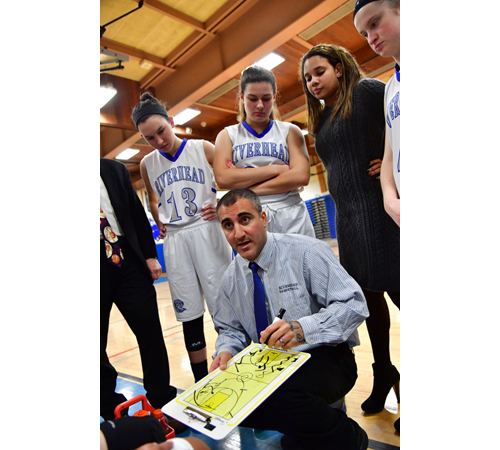 He has just stepped down as the Riverhead High School girls basketball coach to embark on a new chapter in his life. That fact was enough to generate more than a few tears last Wednesday night when Spinella coached his final game for the Blue Waves.